Ever wonder how Memorial Day got its start? Originally observed as Decoration Day every May 30 by the Grand Army of the Republic (GAR) following the Civil War, it was later renamed Memorial Day. Decoration Day was originally intended for soldiers to decorate the graves of their comrades who had died during "the Great Rebellion". For more on the history of this holiday, see the United States Department of Veteran Affairs' webpage entitled Memorial Day Background or the U.S. Army Corps of Engineers' Office of History's webpage on the origins of Memorial Day, which includes some vintage photographs. 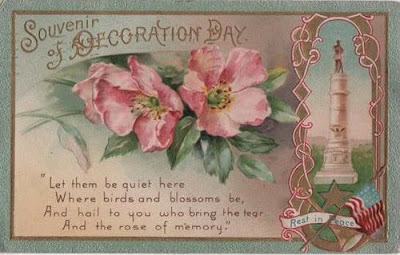 You might also enjoy reading Janice Brown's little history lesson on Decoration Day over at Cow Hampshire.